The flying pig, rumoured to inhabit Cascadia, soars with the grace and style of a small bathtub shot from a cannon. This IPL may be eminently smoother but, as an IPA brewed like a lager, it’s just as rare. 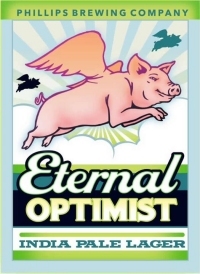 Eternal Optimist IPL is available now at the brewery, and at select bars and liquor retailers in Victoria and Vancouver.